Home » thinking » 2019 – A great year for God! In June this year, I was staying with the Irish Prophet, Brendan Macauley. His house faces the Portaferry waters and so, as the tide was not too far out, it was a great opportunity to sail his little paddle boat with Kerry, and float around aimlessly for half an hour on the water. We moved away from the shore and as we did so, we could hear the loud throb of diesel engines coming from the main road next to the water. We turned around to see a massive convoy of tractors, slowly maneuvering their way down the winding road past us and on into the town beyond. We watched with fascination. 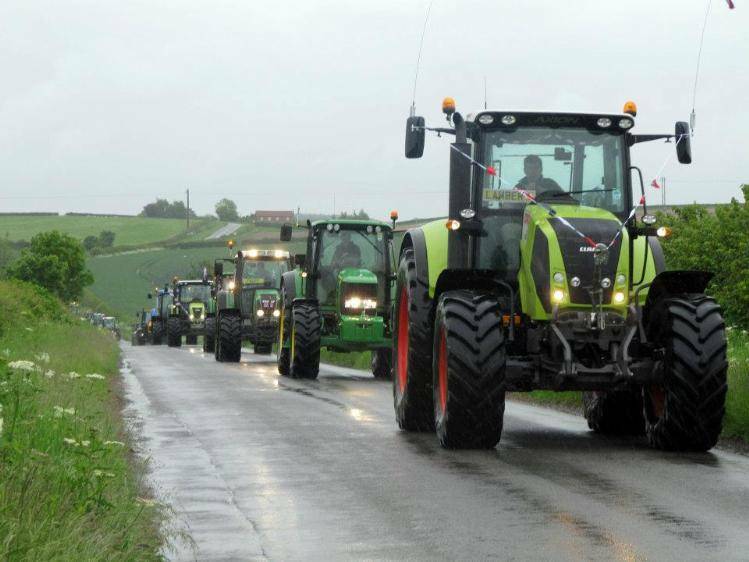 We had never seen such a massive column of tractors, one behind the other, with drivers and passengers cheering and waving enthusiastically to us as they went on their way. Nearly a hundred tractors passed before silence fell on the secluded, seaweed strewn beach! That event dropped out of my memory until last night when I had a dream. In my dream I was back on the water, and events happened exactly as before. I awoke, and realised that I was seeing what I had already seen! This time, I was aware of other issues and the overwhelming sense that I was vaguely glimpsing the future, and because I had been praying about 2019, surmised that God was showing me something about next year. I’m not one for the usual nonsense that happens every year where enthusiastic prophetic groups deem that the coming year is the year of “x, y & z” – especially predictions and strange decrees that are based on the number in the year. So for example, 2025 will be a year of grace because it has a “5” in it! It is just silliness and stops people taking the prophetic ministry seriously. No, God is always powerfully at work (Jer 33:3) we just don’t always detect His activity. So, as I lay in bed I mused over the scene I had seen, and wondered where the tractors had gone. What were they doing – and why did everybody wave to us, total strangers? How inviting, friendly and welcoming! If you have a pulse you will know that there is so much going on in the nations of the world at this time that is both unnerving and causing anxiety for many. It seems to me that God has been diligently putting things in place over time, whilst in the natural it looked like God was not doing anything of significant consequence. Apart from sustaining all things by His powerful Word that is! …Tractors are essential for ploughing, irrigation, harvesting. They are not about to arrive, they are already out there. Something has been going on, out of visual range and on our behalf. Tractors change the landscape too. I have the impression that 2019 is going to be a very good year for God. Every year is, He always gets what He expects, plans and purposes. But I say it in a very human way, I suspect we are about to see an unprecedented move of God in the UK, despite the fear and apprehension of Brexit. Jesus is Lord, and that means He has full control, authority and presence. The awesome factors of omniscience, omnipotence and omnipresence are not things He can muster in a moment of crisis, they are His essence. Everything about 2019, is already planned – and it is an awesome plan. And it is all going the right way. Our part is to pray, not out of fear, but out of faith for the Lord’s Will to be done here, on Earth, as it is in Heaven. I’ve rambled, but read between the lines. It’s going to be ok.